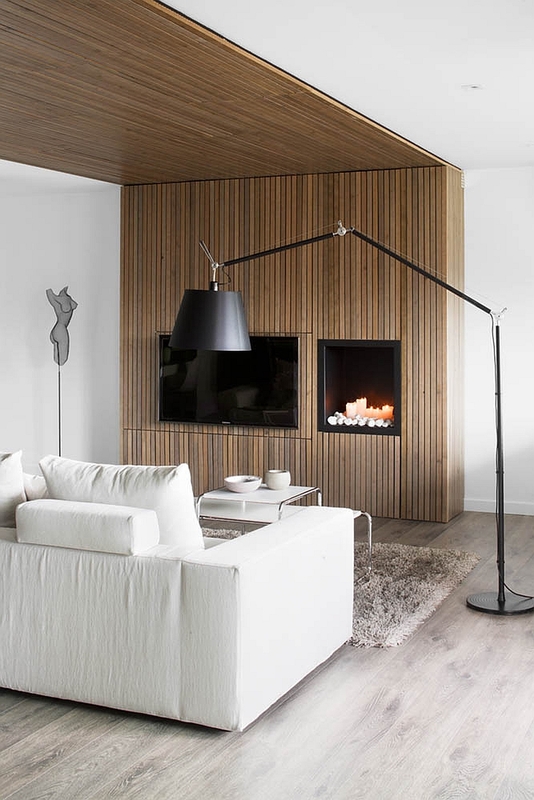 Each one of us has a passion of our own, and we at Decoist have always believed that your home must reflect who you are. 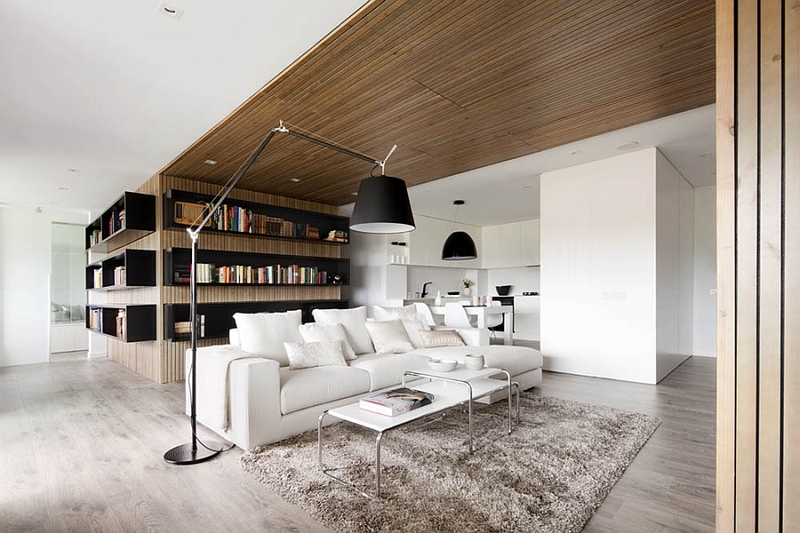 Surrounding yourself with what moves you the most is an important aspect of interior design. 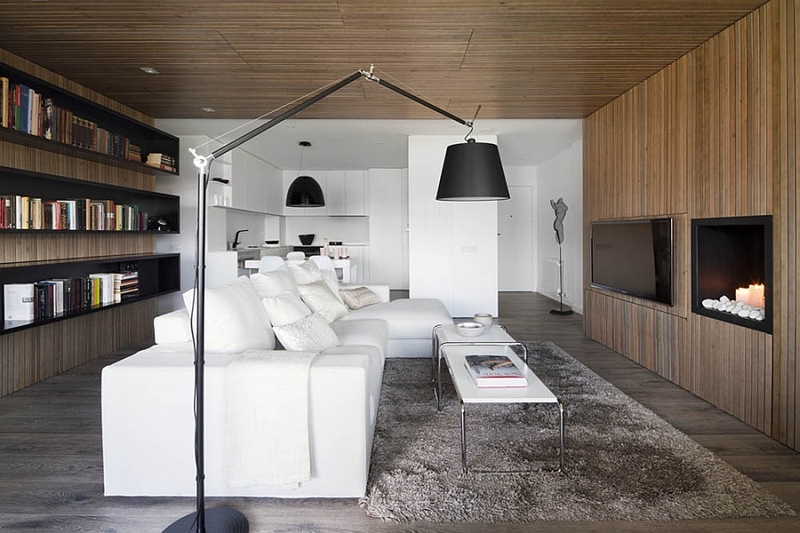 It makes any living space far more appealing and interesting. 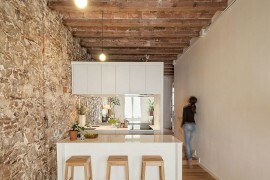 Spanish designer Susanna Cots likes to call this gorgeous apartment in Barcelona a ‘Transversal Expression’. 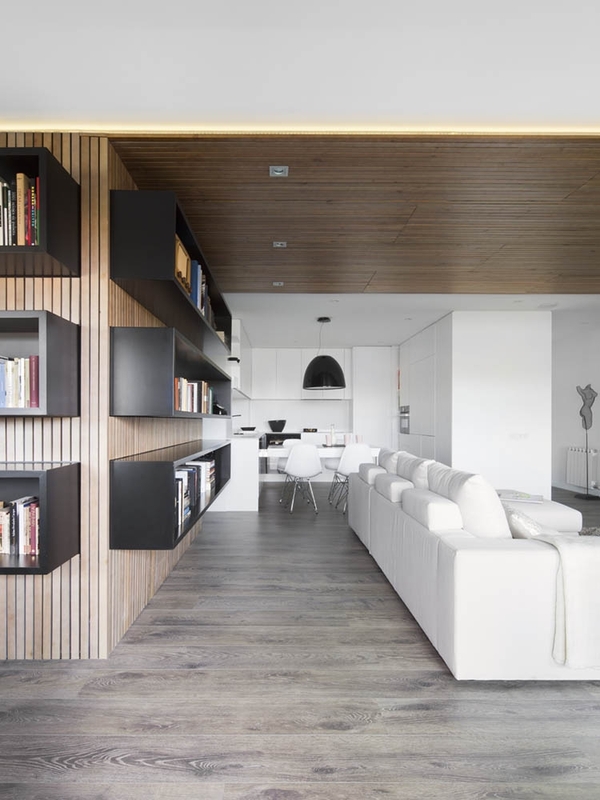 Designed to cater to the needs of two bibliophiles, the contemporary home boasts an eye-catching defining feature–a large wooden lacquered sheet that crosses the living space both vertically and horizontally. It is said that a book lover can often pass away an entire lifetime in a library! 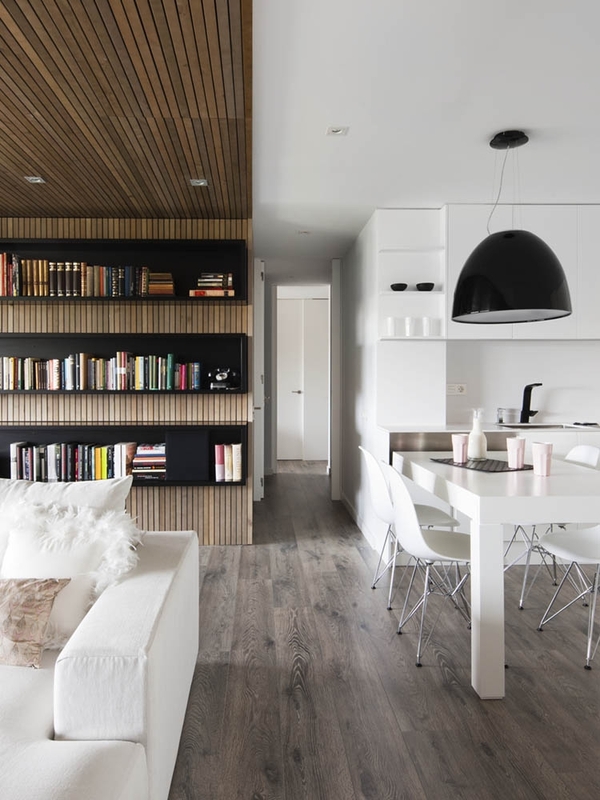 This stylish and chic apartment brings home the library in inimitable style as it combines crisply designed shelves with plush decor and rich textures. 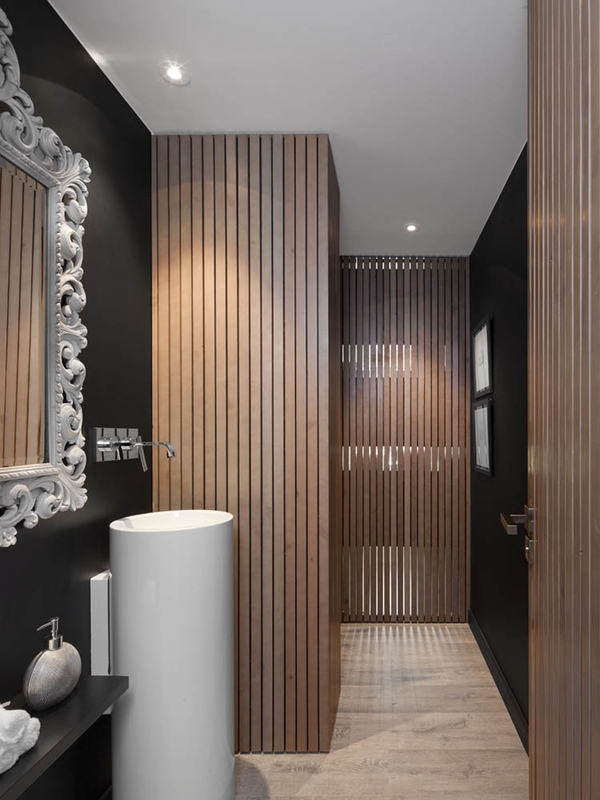 Apart from the impressive skin made of wood, the cool floating shelves in black perfectly fit into the sophisticated elegance of the interior. 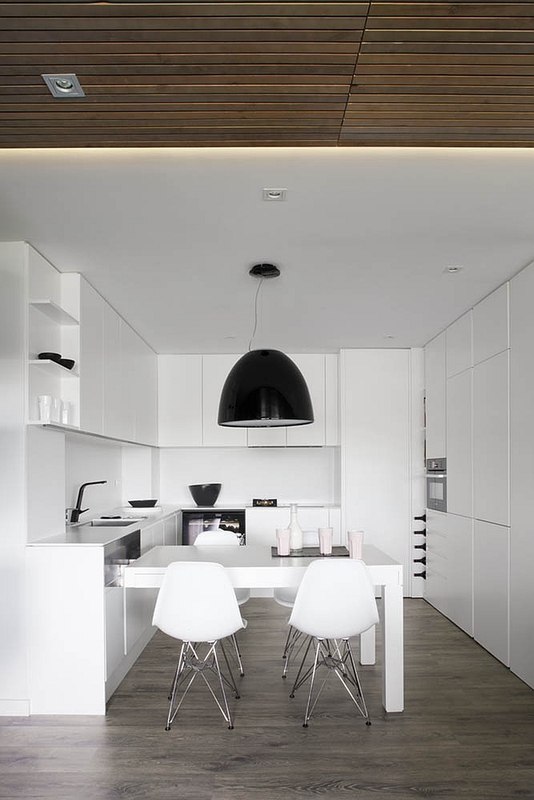 The decor and the walls are clad in unblemished white, while cleverly placed black touches in the form of floor lamps and pendant lights create a sleek, urbane appeal. 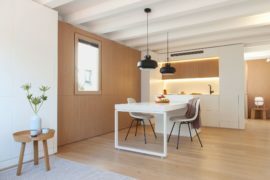 A wood-clad wall on the opposite side holds the wall-mounted TV and a minimalist fireplace, while the kitchen and the dining area are draped in a white lacquered finish. 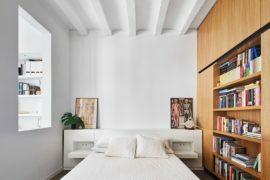 An all-white color scheme and the inviting warmth of wooden surfaces are continued even in the bedroom as a custom-crafted bath next to the bed steals the show here. 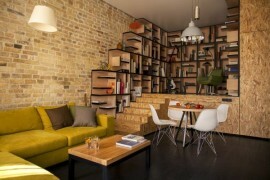 Clean, cozy and exclusive, this is an apartment for those who simply cannot live without their books! 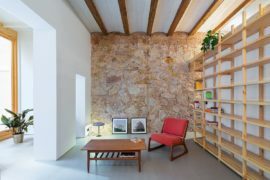 Reading is part of the daily routine of the owners and that is why the central area is transversally surrounded by bookshelves. 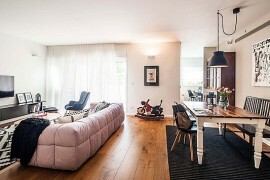 The studio is fully integrated into the living room and creates a corner flooded in light that faces the terrace.